Equipped with a quad-core processor and 1280*800 pixels 10.1 inch screen, the Samsung Galaxy Note 10.1 can express the best video quality of those HD movies. Most of users like enjoying movies on the tablet PCs, especially when they are outside on a trip. If you have purchased some movies/TV shows/Music videos from iTunes store, you may want to play iTunes M4V videos on Galaxy Note 10.1 Tablet to fully enjoy the iTunes movie. However, Android tablets like Galaxy Note 10.1 cannot play iTunes videos due to DRM restriction. The best way to enable Galaxy Note 10.1 play iTunes M4V movie is to remove DRM restriction from those iTunes M4V video files. And without the DRM protection, M4V video format is still unavailable on Galaxy Note 10.1. 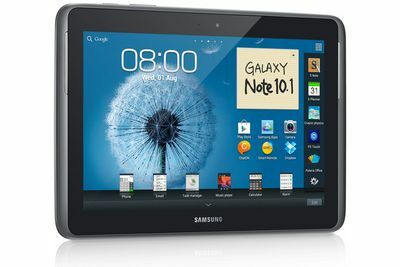 So you also need to convert M4V videos to Galaxy Note 10.1 compatible video formats. NoteBurner M4V Converter Plus combines both of above functions together and makes it easier to transfer iTunes M4V to Galaxy Note 10.1 for enjoying. With simple user interface and succinct operation, NoteBurner M4V Converter provides the best converting experience as the best iTunes M4V to Galaxy Note 10.1 converter on Windows. ✔ Remove DRM from iTunes M4V purchases. ✔ Convert protected M4V videos to MP4, AVI, MOV, FLV, MPEG, etc. ✔ Unlock DRM M4V to popular portable devices. ✔ Support customized conversion and life-long upgrade. Simple Guide: Get rid of DRM and Sync iTunes M4V video for Galaxy Note 10.1 Playback. Step 1. Add iTunes M4V to NoteBurner M4V Converter on Windows XP/Vista/7. Free download the program and install it to your hard drive. Then launch the program and the iTunes will automatically run at the same time. Click the add button and choose the M4V movie for input from iTunes library. In order to transfer iTunes M4V to Galaxy Note 10.1, you need choose a compatible output video format. We recommend you click the drop-list and choose Customized MP4 Movie (*.mp4). Step 3. Adjust the profile for iTunes M4V to Galaxy Note 10.1 conversion. To get the high quality of output MP4 video, you also need adjust the video and audio parameters. According to the screen size and definition of Galaxy Note 10.1, you are recommended to set the video size to 1280x720 and change the Video Bitrate into 2000k. Step 4. Convert DRM M4V to Galaxy Note 10.1 MP4 video. After setting the profile, you need click "Convert" button to start to transcode DRM M4V to Galaxy Note 10.1 with NoteBurner DRM M4V Video Converter.